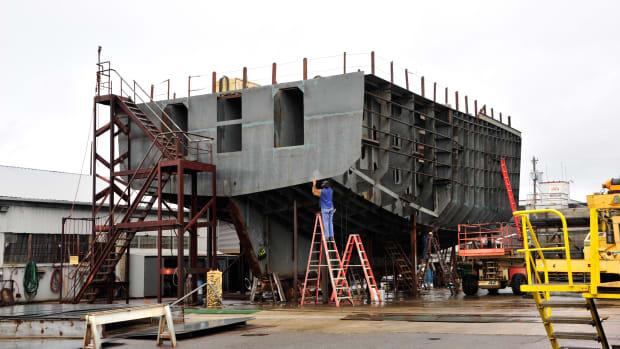 The cored composite, fiberglass-reinforced plastic (FRP) construction technique has changed the face of recreational boatbuilding and ownership. In fact, it’s safe to say that it represents the single greatest evolutionary change in boatbuilding of the past century. As revered as wood boats may be, their labor-intensive construction and equally labor-intensive upkeep made it unlikely that they would ever achieve mass appeal status, not to mention affordability. With the advent of FRP and the resultant small craft popularity explosion in the 1950s and 60s, boat ownership became a reality for tens of thousands of folks who otherwise would have never considered the possibility of spending time on the water. Cored composite construction added a new twist to the space-age FRP material. In simple terms, cored composite construction consists of a “sandwich” with fiberglass laminate as the “bread,” and a core material, balsa and plywood with a variety of PVC or other synthetic foams and honeycomb materials, as the meat. The exceptional stiffness offered by composite construction is significantly greater than the FRP or core material alone. The combined product is often likened to an I-beam, with the FRP laminate as the beam’s “flats” and the core as the vertical support. As near-miraculous as FRP and composite construction may be, it’s not without its pitfalls. Because it’s strong, stiff, and light, nearly every fiberglass boat afloat uses some type of cored compost construction, particularly in deck and cabin structures. Some builders use cored composite for hulls as well, either above the waterline alone, or for the entire hull structure. The primary nemesis of cored composite construction is water penetration into the core, which can lead to its deterioration and delamination of the composite structure, as well as adding significant weight to the vessel. Ideally, when a boat is designed, a naval architect or builder details where each piece of deck or hull hardware will be installed. Knowing this, the builder laminates into these areas, either solid fiberglass (i.e., an area where no core is used), or a special high-density, crush-proof, and water resistant core that’s designed for this purpose. Then, the folks drilling and cutting the holes on the shop floor install the hardware using the accepted method of measuring, drilling, and applying sealant. However, builders often fail to install these special solid FRP, or high-density core hardware pads, or hardware is added after the design is complete. In either case, another approach is required. The industry’s “best practice” (admittedly, it’s not widely used in after-market applications, but you can change that with this information) procedure for installing hardware on or in cored composite construction is specific and well documented. In brief, after the location for the hardware is determined, mark and drill the holes for the fastener to be used. Then, re-drill only the outer skin hole about half again as large as the previous size (i.e., a 1/4 (.25)-inch hole would be re-drilled to 3/8 (.375) inches.) Dig or “reef” out the core material for a distance of about ½ (.50) inches around the inside of the hole using a pick, screw driver, or a router (wear eye protection). It’s important that the reefing “capture” any trim ring or outer fastener holes such as those that might be found around a portlight or windlass foot switch. Cover the lower hole from inside the cabin with masking tape and then fill the void using epoxy thickened to the consistency of mayonnaise (West System and 406 or 404 filler work well). This is often referred to as backfilling (or as a procedure, reefing and backfilling). Apply the epoxy slowly using a small brush or syringe to prevent air entrapment. Once the epoxy has fully cured, re-drill both holes, so they are slightly oversized and chamfer the edges of the outer hole to create a land for sealant. A ¼ (.25)-inch fastener would call for a 5/16 (.3125)-inch hole. Now, wipe the area down with a damp rag to remove amine blush, a water-soluble wax that forms on the surface of cured epoxy (there’s no need to use solvent). Then, wipe the hardware—the fasteners that are to be installed—with a clean rag (a “clean” rag is one that has been rinsed to remove any residue of detergent or surfactant) moistened with 3M General Purpose Adhesive Cleaner or mineral spirits to remove wax, oil, and other contaminants. The power of these contaminants to cause sealant failure should not be underestimated—just watch the rag turn black as you wipe down the hardware: that’s wax and cutting oil. Finally, apply polyurethane bedding compound to the bottom of the hardware as well as to the fasteners. Do not apply bedding compound to the portion of the fastener, washers, nuts, or backing plate inside the vessel; avoiding the use of bedding on the inside will allow water to leak into the vessel when the outer bedding fails, letting you know it’s time to re-bed. Bedding on the inside of the fastener will only hold the water in the fastener hole, which may lead to fastener crevice corrosion or water penetration into the core (water is the universal solvent and given enough time it will go anywhere). Clean up as much excess sealant as possible (you should have plenty of squeeze-out) using a clean dry rag and then finally using a rag moistened with Adhesive Cleaner. Be sure to follow the sealant manufacturer’s inhibit the curing process. With this approach, you’ve achieved two ends. You’ve virtually eliminated the possibility of water entry into the core at the fastener penetration. And just as important, the epoxy annulus prevents the fastener from crushing the core (a 1/4-inch fastener can exert more than 500 pounds of pressure on the core; four closely spaced fasteners could apply a ton of force). If the fastener crushes the core it will almost certainly lead to water ingress because of the funnel-like depression that’s created. All penetrations, from pad eyes and antenna bases, to cutouts for vents, ports, and hatches, in cored substrates should receive this treatment. Beware; some professional installers will have you believe that you can rely on the legendary tenacity of polyurethane bedding compounds, such as 3M’s 5200, to keep water from entering the core. As sticky and water resistant as this material may be, it, like all bedding compound, has a finite lifespan, usually on the order of five to seven years and often less when used on heavily loaded parts. Thus, the hardware installation method that’s used must take into account this inevitable breakdown in the material’s watertight integrity. HOT COATING CORE: DOES IT WORK? Yet another common error involves the half-measure of “hot coating,” or simply “painting,” the exposed core with a thin film of epoxy or polyester resin. While this approach is certainly better than nothing, it’s flawed in that the extremely thin protective layer is easily damaged when hardware is installed and torqued. This coating does nothing to prevent the aforementioned localized crushing and it will not capture outer trim ring fasteners. Before buying, ask a builder how they have dealt with “core closeout”—the term for reinforcing and sealing core from penetrations—and hardware installation. If you already own a boat, make certain that before any boatyard or contractor takes a drill or saw to your pride and joy, they explain to you their approach for core closeout. I’m a believer in the axiom “trust but verify” and thus recommend that you avoid leading. Simply ask: “How do you approach core closeout, sealing, and reinforcing core where hardware will be installed?” The response will speak volumes. Safety Check: Are You CO Detectors Working?